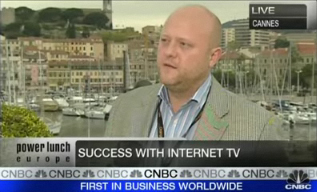 Reed MIDEM has just published video footage from the keynote speech Jeremy Allaire delivered during MIPTV's Online Video day. CNBC is also featuring highlights from the conference, including a live Power Lunch interview with Ross Westgate from CNBC Europe. MIPTV was the backdrop for some exciting Brightcove announcements. Brightcove unveiled a powerful lineup of new distribution partners including Bebo, Meebo, RockYou, Slide and Veoh. Media companies using the Brightcove Internet TV platform can now take advantage of expanded distribution through social networks and video portals while maintaining control over their content and advertising (read more). The distribution partners have a combined audience reach of over 300 million monthly uniques and Brightcove customers like The Weather Channel, Sony BMG, and VBS.tv are already taking advantage of the opportunity (see coverage in The Guardian, Broadcasting & Cable, C21, Media Week). At MIPTV, Brightcove also announced that Ministry of Sound, Europe's largest independent record label, has adopted the Brightcove Internet TV platform to launch an aggressive online video initiative that will include advertising-supported distribution on its own websites, as well as through viral widgets available on MySpace and Bebo (see coverage in Billboard Magazine).